The Alona Beach is one of the most famous tourist spots in Bohol province, Philippines, because of its white sand and the rocky cliffs. The beach is located near a "house" reef, where corals and colorful fishes can be seen even without diving equipment. It is a popular scuba-diving and snorkeling spot. It is situated less than two miles from the new Bohol-Panglao international airport. 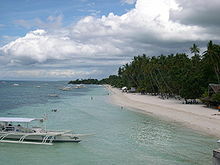 The beach is situated on the Panglao island, Philippines, just before the Panglao city. It is situated around 20 kilometres (12 mi) from the port of Tagbilaran and is accessible by a sealed road. It is accessible by car, motorbike or Jeepney. Compared to other tourist locations, Alona Beach is rather small as it spans less than one kilometer (half-mile) of white powder sand surrounded by rocky cliffs. The dominant economic activity is tourism. The beach is lively,[clarification needed] clean and quiet, but there are not many water activities in town. [clarification needed] Many people enjoy to stroll at sunset when the sky colors are spectacular. There is a number of restaurants, bars and resorts located on the left side and the right side of the beach, and they close down and stop playing music by 10 pm to protect the tourism industry which relies on early morning tours. Many resorts are offering a wide range of accommodation options with scuba and snorkeling as the most popular activities. The beach connects to the Penglao island circular road. Therefore, reaching other parts of the island is easy at almost any time of the day. Jeepney, private cars, tricycles, vans offer multiple options to move around. The underwater ecosystem is protected and the access to the marine reserve is limited every day. From time to time, boat trips are organized as far as Oslob to see whale sharks. Some can be spotted sporadically in the vicinity of the beach. The underwater fauna and the flora are rich ; there are many healthy corals (inc. black coral), schools of fish (e.g. sardines), turtles, barracudas, lobsters and if lucky one may even spot whale sharks or dolphins. The underwater current can be quite strong from time to time, creating a lot of turbidity in the water. Alona Beach is a reputed destination for snorkeling and more importantly scuba diving. The nearby Balicasag and Pamilacan islands are of particular interest since both are marine reserves. There is a large number of dive shops in Alona Beach offering a variety of diving certification courses, technical courses and excursions for divers of all levels. Drift diving is a popular activity. Some sport fishing is organised on the beach but the main center for this activity is the seaport of Panglao city. Urchins are picked by locals and sold as a delicacy snack on the beach. ^ All About Alona Beach, from the Unofficial Guide. Unofficialguide.ph. August 2018. ^ "Inside the Chaotic World of Whale Shark Tourism". Animals. 2018-08-30. Retrieved 2019-01-11. ^ Heneage Mitchell; Kal Muller (March 2003). Diving Southeast Asia: A Guide to the Best Dive Sites in Indonesia, Malaysia, the Philippines and Thailand. Tuttle Publishing. pp. 209–. ISBN 978-0-7946-0076-1. Wikimedia Commons has media related to Alona Beach. This page was last edited on 11 January 2019, at 00:57 (UTC).